In 2005, Bobby Henderson wrote a letter to Kansas School Board. Henderson, a 30-year-old physicist from Oregon who currently lives in the Philippines, proposed an interesting point of view in the debate over teaching Intelligent Design in schools together with Evolutionism. He claimed, “I and many others around the world are of the strong belief that the universe was created by a Flying Spaghetti Monster. It was He who created all that we see and all that we feel. We feel strongly that the overwhelming scientific evidence pointing towards evolutionary processes is nothing but a coincidence, put in place by Him.” He exposed his theory with the same terminology usually employed to support the Intelligent Design; his letter even contains a graphic that shows the correlation between global warming and the decrease of pirates. Since 2005, the Church of the Flying Spaghetti Monster (FSM) grew and became famous worldwide, especially through the internet. On the website many topics are discussed with a religious language and a great amount of sarcasm. Henderson, who has a personal blog with many pictures of palm and boats, is the administrator of the website; however, this FMS internet space is mostly made by the contributions of FMS followers from all over the world. Do all these people really believe in a flying bundle of pasta? Probably the majority of them do not. But the ways they contribute to the website and the ways they interact with each other online are important to understand certain features of today’s society and there are some considerations that the FSM compels us to make. The first consideration relates to the role of secularism and atheism in the U.S. and Western societies in general. The separation between church and state is a widely discussed topic in many countries and the term ‘secularism’ is sometimes used as the antithesis of the word ‘religious’. Many national and local secular associations often express their general attitude against religion in public life, and there are different types of activism. New Atheism, for example, is a name attributed to a group of atheists that published works promoting a more aggressive stance against religion. Richard Dawkins, an exponent of this group, published many books advocating for a more secular society. The Flying Spaghetti Monster, on the one hand, is a phenomenon that can be associated within this tendency of speaking out against religions and supporting non-religious institutions. On the other hand, however, Henderson and his Church have a slightly different approach to the topic. In the website they underline the importance of respecting all religions and they take no clear position against a particular faith. “We are not anti-religion, we are anti- crazy nonsense done in the name of religion. There is a big difference. Our ideal is to scrutinize ideas and actions but ignore general labels.” Therefore, the FSM Church uses methods that are different from the ones of Dawkins and some of his colleagues. While many exponents of New Atheism employ science and logic reasoning to explain the contradictions within different faiths, the FMS uses a religious language, but with a distortion of the meaning. Sentences and positions that are considered legitimate within mainstream religions are transformed in illogic ad absurd sarcastic stances. A letter from a website user named Katie, for example, supports gay marriage with these words: “Since gays and lesbians have been chosen by Him, to deny them the right to get married is an abomination in His eyes (meatballs).” This claim does not offer any evidence to support its position, and it is hilarious because it involves the authority of a god made of spaghetti and meatballs. However, since the whole letter uses religious patterns and languages, it implicitly criticizes the faith-based approach many religions use to express their positions about gay marriage. With a laugh, many people could actually start a more serious reflection about their beliefs. A second consideration we can do about the Flying Spaghetti Monster is the authenticity of this Church. Obviously, Henderson’s idea was to create an unconventional god that could ridicule religions and expose the illogicality of the Intelligent Design, and then the followers make this phenomenon grow using the digital space. However, for many followers the FSM may be authentic for the ideology it represents; also, given the great success it had in a relatively short time, it might involve something more substantial. Henderson wrote on his blog in 2010 “we’re at the dangerous place where we either become more real or more fake and both worry me. Don’t want the church of FSM turning into Scientology or Mormonism.” The FSM makes us reflect also about the authenticity of many new religious movements; with today’s proliferation of non-mainstream religions, legal and sociological problems are linked to the authenticity of beliefs. Within the European Union, for example, all countries formally support freedom of religion; but how is it possible to determine what a religion is, and to prove whether someone truly believes or not in a god? This complication is well exemplified by the FMS’ Austrian follower Niko Alm, who, in 2011, was allowed to wear a pasta strainer in his driving license’s picture as a religious headgear for Pastafarianism. While Alm’s claim is most likely a provocation against the Austrian recognition of confessional headgears, it underlines the problem of authenticity within a context of religious freedom. If all religions have equal dignity, it is necessary to decide where to draw the line between religious and non-religious. Alm had a psychological exam and was declared ‘fit to drive’; however, there is no way to objectively prove if he, or any other follower of any non-mainstream religion, is authentic in the practice and beliefs of his faith. The third point that is interesting to analyze is the incredible spread the Flying Spaghetti Monster had through the online sphere. Henderson is the authority behind this phenomenon, since he created the website and had the idea of the FSM. However, it seems that Pastafarianism evolved through the web thanks to the active contributions and new ideas of its followers. In this perspective, there is the creation of a Third Space, developed online with people’s real life experiences. Without the internet, Henderson letter would most likely remain an isolate episode. The web not only made this phenomenon grow, but created a new space of discussion in-between the online and the offline world, where people are active in generating new meanings with their contributions and interpretations of the FMS. It is an example of Third Space also because there is a process of community formation that is continuing evolving through the official website and other webpages created around the world. 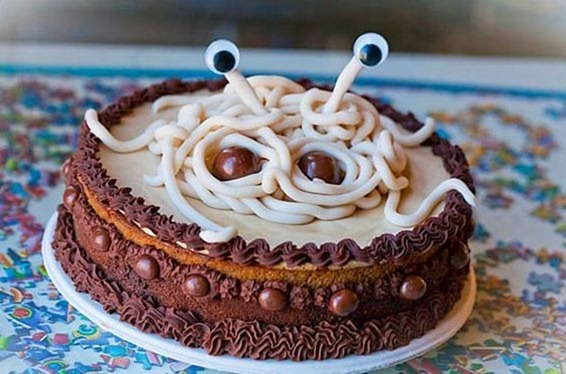 Most of the website’s contents are people’s pictures of cakes, Halloween costumes and even Christmas decorations with the shape of the Flying Spaghetti Monster. 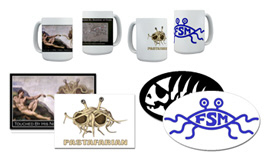 The Website’s users are active in commenting the blog and there are gadgets and flyers one can buy in the ‘Propaganda’ section to circulate the beliefs of Pastafarianism, with even a design context and the Gospel of the FMS available on Amazon. 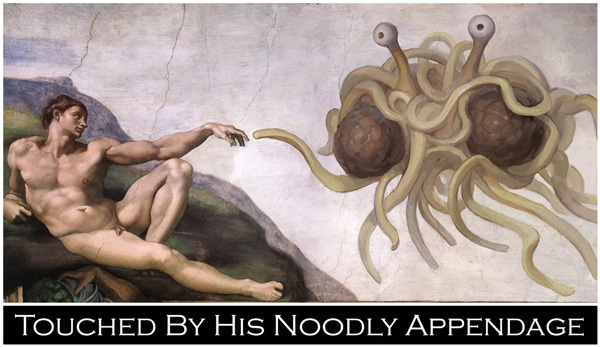 Atheist groups worldwide adopted the Flying Spaghetti Monster as a sort of symbol, using it also for parades or events. This in-between-ness of online and offline activities certainly contributed to the addition of new features to the Church and creating groups outside the U.S. For example, despite the fact that spaghetti with meatballs are not that popular in Italian cuisine as some may expect, the Chiesa Pastafariana Italiana gathered followers in Italy. According to the website, there are also local initiatives, like a special partnership for restaurants and pub owners. Similarly, the French created the Sainte Eglise du Monstre en Spaghetti Volant, a website where serious and less serious matters are discussed in a FMS perspective. The FMS is not openly and actively promoting resistance against institutionalized religions, but it certainly is a provocation against many aspects of the society, like religious education in public schools or the presence of religious influence in governmental institutions. The website’s users are most likely more attracted by the goliardic and sarcastic dimension of the FMS than by the idea of a political action against religions and institutions; however, what the internet space allows is the creation of continuously evolving communities worldwide where people with similar beliefs can share their viewpoints and, using an ironic attitude, discuss about social issues. Bobby Henderson wrote on the website “FSM is a real, legitimate religion, as much as any other. The fact that many see this as a satirical religion doesn’t change the fact that by any standard one can come up with, our religion is as legitimate as any other. And *that* is the point.” Probably FMS’ propaganda will not convert entire countries to the worshipping of pasta, but it will offend some religious people and will make others laugh. However, Henderson is right when he says that the Church of FMS is real, because it produces awareness that is evolving through online and offline communities. The FMS is authentic not because it truly exists, but because atheists and skeptics use it as a way to express their feelings; not an open fight against mainstream religiosity, but an internet laugh to encourage people to use rational thinking in addition to their approach to faith. Maybe- and hopefully, according to Henderson’s words- the Flying Spaghetti Monster will not become the guru of a new ‘cult’; but, most likely, he will continue to touch many internet users with his noodly appendage.